Since August 2015, Yan Jin is a instructor and doctoral candidate at the Department of East Asian Studies of University of Göttingen. Yan Jin received her B.A. in International Politics and an M.A. in Modern Chinese History, both from Fudan University. Before she moved to Göttingen, Yan Jin had been lecturer/assistant professor at the History Department of Fudan University in Shanghai, China for 16 years. During parts of this time, she served as Director for Student Affairs of History Department, as Assistant Director of the Fudan Asia Study Center, and as coordinator for the Global History Program at Fudan University. Moreover, she has teaching experience as a visiting professor at various universities outside China, including University of Vienna (Austria), Jacobs University (Bremen, Germany), Leipzig University (Germany). Yan Jins main research interest is modern Chinese intellectual history and the history of Shanghai. She has worked and published on topics like Christianity in modern China, Chinese national identity in modern times, Shanghai studies, etc. 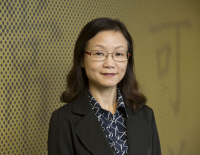 Currently, she is working on the global entanglements of modern Chinese intellectuals, particularly the question of how connections with both the West and non-West, shaped some social, political and material aspects of the modern Chinese intellectual life.